A Visitation for family and friends of Perry Olson, beloved husband of Donna of Regina, formerly of Calgary and the Preeceville District, will be held on Tuesday, February 12 from 7:00 - 9:00pm from the Chapel of Preeceville Funeral Home. The Funeral Service will be held on Wednesday, February 13 at 1:00pm from the Chapel of Preeceville Funeral Home with Reverend Miles Russell officiating. The interment will take place in the North Prairie Cemetery. Memorials in memory of Perry may be made towards a Trust Fund for his daughter, Kelsey, or to the Charity of One's Choice as gifts of remembrance. Arrangements have been entrusted to Regina Funeral Home in cooperation with Preeceville Funeral Home. 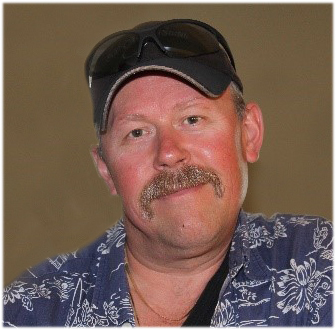 Perry Olson, resident of Regina, SK formerly from Preeceville passed away suddenly on Friday, February 8, 2019, at Regina General Hospital at the age of 56 years. Perry was born on September 7, 1962, in Preeceville, SK and grew up on the family farm just north of town. He attended Preeceville School until he joined LCBI in Outlook, SK and received his Grade 12 Diploma. After graduation, Perry left home to the oil field workforce. He was employed as a shooter until settling in Calgary, began driving truck for Bridgebrand Foods and eventually becoming shop maintenance personnel. He and his wife moved to Regina in 2011, where he then began working for Manitoulin Trucking until the day of his passing. He enjoyed riding his Harley, spending time at the cabin, hanging out with family and friends and absolutely anything that had to do with his daughter. Perry was the "entertainer". No matter where you went, if you weren't laughing with him, you were laughing AT him. His laughter and his mustache will be the legacies that live on forever! He will be deeply missed by his wife Donna; his precious Princess Kelsey; stepsons Logan (Marnee), Gregory (Nicole) and Braedon (Samantha); granddaughter Hazely; brother Tim (Denise); sisters Pat (Clay) and Angela (Mark); father and mother-in-law Wayne and Carole; sister-in-law Trish (Dave); brothers-in-law Dennis and Barry (Tina); nieces Kara, Krista, Kira, Ashley, Kaitlyn and Rachele; nephews Tye, Jess, Cole, Chris, Austin, Brody and Eric; his BEST FRIEND Darcy (Pat); as well as many, many others. He was predeceased by his father Lavern; mother Florence; brother Wayne; and nephew Brandon.